Who’s ready for spring? Winter doesn’t usually bring me down. Short days are all the better for reading while wrapped in a quilt, and I love fires and big pots of soup. But this year, by mid-February, I’d had enough. Please, I thought, no more walking on sodden ground. No more bicycle commutes that end with me slopping my wet clothes into the bathtub and shivering until the furnace kicks in. No more gray sky, gray earth and gray attitude. Today, it’s still rainy, but seemingly overnight the daffodils have shot up, and some even have buds. On my walk to the grocery store last week, I passed through clouds of daphne and osmanthus. Best yet, it stays light past six o’clock. 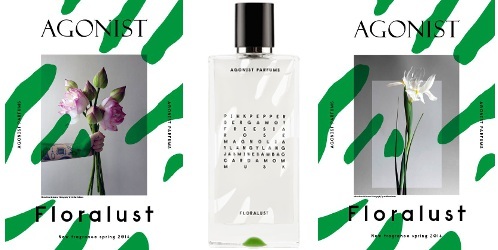 Perfumer Fabrice Pellegrin developed Floralust, and its notes include pink pepper, bergamot, freesia, rose, magnolia, ylang ylang, jasmine, cardamom and musk. In short, it’s an easy background sort of fragrance, the kind you might spray on lampshades, sheets, and your wrists when you don’t want to draw attention to yourself, but want to smell nice. Floralust’s first whiff is of juicy citrus, more like wet orange blossom than bergamot to me. Right away, pink pepper gives structure, and a middle-of-the road musk — not too clean, not too itchy-woody, not animalic at all — adds a sheer foundation. Within this framework is a fresh bouquet of magnolia, freesia, rose and ylang ylang. It smells as if the vase is across the room, and no one note stands out. A sliver of cedar seems to waft in and out, but that might be a trick of the pepper. Floralust lasts about half a day and should be office and baby friendly. Agonist lists it as “unisex,” and I love smelling florals on men, but macho types might seek out a springlike vetiver instead. And that’s about it. Floralust doesn’t try to make a statement, and while that’s its greatest asset, it’s also a drawback. For the fragrance’s price — $195 for 50 ml — a perfume shopper with a budget might wonder what she’s getting that’s all that different from what she’d find on department store shelves for less. Light florals with shots of pepper and musk aren’t exactly unicorns. What sheer springtime florals do you like? Byredo Flowerhead and Chloé L'Eau de Chloé come to mind. Anything else? Agonist Floralust is $195 for 50 ml. For information on where to buy Floralust, see Agonist Parfums under Perfume Houses. When spring comes along I tend to grab a few good sprays of the sadly discontinued Folavril by Annick Goutal. Folavril! Such a strange and delightful scent. I love it for spring, too. In the back of my mind, I’m remembering that I might have a sample of Ofresia somewhere. Now I’m off to find it! It seems like some niche companies have lost their way, unless they have done some consumer testing and think they can make money by releasing scents similar to ones commonly found in dept. stores, which wouldn’t surprise me. If that’s the case, though, I wonder how long this will remain the case. Is nearly everyone going to own a few hundred bottles or more within the next couple of years? Or are a whole lot of niche companies going to “come and go” in the near future? Starting a fragrance line must be a lower-barrier industry than I’d thought. It seems like everyone and their uncles are starting new perfume houses. They can’t all possibly thrive. That said, Agonist has been around for a while compared to many niche lines. Read the title of the review and thought, “Oooh, Agonist might finally have made something I want to test.” Turns out, naaah. I’m good. I mean, it’s probably nice, but I’m saving up for Parfums DelRae Wit. It’s so funny that you mentioned Wit! I’ve been trying to talk myself out of ordering it. So far, I’ve held back. But it’s not easy…. Argh! Tell it to my bank account!! I’ve been hankering for vintage Diorissimo. Such a strange fragrance. But this is more the time of year that I wear chypres than sheer florals. Although we had a super warm February this year, DC is generally coldest in January and February, and still relatively cold and bleak in March. IIRC, the coldest months are November and December in other parts of the U.S.
Green chypres and spring are such a great combination. And isn’t it strange how Diorissimo is perfect in just about any weather except burning heat? One more comment: I know what you mean about Diorissimo being “strange.” It has that funny kerosene-like hit that makes its prettiness so much less precious. For me, this time of year calls for green fragrances and chypre-like perfumes. I like Ann Gerard Perle de Mouse and I wore No.19 at the weekend. I was wearing vintage Diorissimo during winter and will probably continue to wear it in this weather too. I love Perles de Mousse so much! It’s such a lovely, springlike perfume of the classic variety.